Lions meet the needs of local communities and the world. Our members do whatever is needed to help their communities. On Beautiful Grand Lake o’the Cherokees, at the Langley Ball Fields, October 22, 2016, 11:00 am to 2:00 pm. 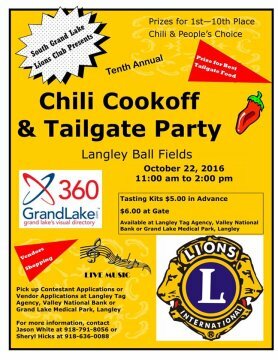 On October 22, 2016, the South Grand Lake Lions Club will host its Tenth Annual Chili Cookoff, to be held at the Langley Ball Fields. In addition to the Chili Cookoff, there will be a Contest for Best Tailgate Food. The entry fee for chili is only $25 and the entry fee for Tailgate Food is $10. Vendors can purchase a 10 x 10 space for $25.00. There will be prizes for 1stthrough 10th Place Chili, as well as 1st, 2nd and 3rd People’s Choice. Tasting Kits will be available for $5.00 in advance and $6.00 at the Gate. You can purchase tasting kits in advance at Langley Tag Agency, Valley National Bank or Grand Lake Medical Park, Langley, OK. Formed just nine years ago, the South Grand Lake chapter of the Lions Club, has grown to a total membership of 89, and is the largest Lions Club in the State of Oklahoma. This is due to the dedication of its members, through fun and fellowship, to make our community a better place. Through our fundraising efforts, from the Grand Dam Run, to the Grand Lake BBQ Festival, to the Chili Cook Off festival, we have raised thousands of dollars, which has helped fund the Ketchum Back Pack Program, the Veterans Plaza in Langley, scholarships for Ketchum High School students and the eyeglass program. Our latest service project is to purchase a Spot Vision Screening Camera to screen the children of our community for vision issues. If you would like to enter either contest or participate as a vendor, you can pick up an application at Langley Tag Agency, Valley National Bank or Grand Lake Medical Park in Langley. If you would like further information, please contact Jason White, Septics R US at 918-791-8056 or Sheryl Hicks at 918-636-0088. Everyone is invited to come out on October 22, to participate in the fun and support the community. Please turn in money and unsold tickets to Tami Bailey at Grand Lake Medical Park no later than 5:00 on Thursday, October 15, 2015. You are responsible for all tickets that are assigned to you. Ticket prices are $5.00 in advance and $6.00 at the gate. We encourage all team members to purchase a tasting kit so they can taste their opponent’s chili. You may set up at 8 am on Saturday morning, October 17 and your area will be marked off for you. You may bring your automobile to your booth site to unload. However it must be moved after you unload. COMPETITION: Please bring a minimum of 4 gallons of chili and do not serve anyone before 11:00 a.m. Please serve small portions as they have several booths to go to. A bite or two is all that is necessary. Please feel free to ask people for their votes. TRASH: Please keep your area clean. Trash cans will be provided; however having your own trash bags will be helpful. We are very fortunate to have this facility, so please help to leave the park clean. JUDGED CHILI: We will have judges totally unknown to any of the participants. A bowl with a lid will be provided for your judged chili. Someone will come around for a sample for your judged chili to take to the Judges. Points for judged chili will be allotted as follows: 25% toward aroma, 25% for looks, 25% for taste and 25% for aftertaste. The food lines should be completed by 2:00 p.m. At that time, your People’s Choice vote containers will be collected. PEOPLE’S CHOICE CHILI: These awards will be determined by the number of pre-sold tickets, tickets (votes) received in your container, and dollars in your container your team receives during the chili cookoff. Make sure your containers are marked with your name on it. People’s Choice will be judged on which team receives the most votes from the public . 1 ticket equals 1 vote. $1 equals 2 votes. Any pre-sold tickets sold by your team count as one vote per each ticket sold. This is a fundraiser and you are most definitely encouraged to bribe people or do whatever is necessary to put money into your containers. The main thing is not get too serious and HAVE FUN!! LIONS LAIR AWARD: The team that exhibits the most spirit and showmanship, along with their booth decorations and costumes. BEST TAILGATE FOOD: There will be a booth to turn in your Tailgate Food. This food will be judged for 1st Place. We ask that you bring at least 50 bites and we will sell the excess for $1.00 for two bites. AWARDS AND PRESENTATIONS: Plaques and Cash awards will be presented at 2:30 or as soon as the judging has been tabulated. Please have your team available for the awards and pictures at that time. Judged Chili: 1st, 2nd and 3rd receive a plaque and Cash prizes of $100, $75 and $50 respectively. ENTRY FEES: Entry Fees are $25.00 per chili team and $10.00 to enter for Tailgate Food. These fees are due at sign-up and are non-refundable. If a team does not show up, the fee will be considered a donation to the South Grand Lake Lions Club. Langley Ball Field is well equipped with electricity but you must bring an extension cord. The South Grand Lake Lions Club is so grateful for your participation in our event. The proceeds from this event benefit our general administration fund. Some of our causes include the Ketchum Backpack Program, the Veterans Plaza in Langley, scholarships for Ketchum High School students, Meals on Wheels, and our eyeglass program. Our fundraisers include the Grand Dam Run in April, the KCBS sanctioned BBQ Festival in May, and of course the Chili Cook Off in October. Not only do we raise thousands of dollars for our community, we actually have a lot of fun doing it. If you would like to be a member of our organization, please contact Tami Bailey at Grand Lake Medical Park in Langley, 918-527-8780.